At 77, Joyce has won 257 National, International, Senior Olympics and World Senior Badminton titles. She’s received the Award of Merit Trophy for Outstanding Service and Sportsmanship and was inducted into the Badminton Senior Hall of Fame. 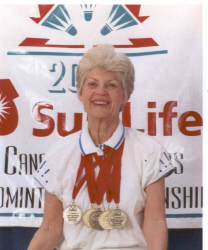 She is the highest tournament title winner in the Canadian Senior Championships with 60 titles. In 2000, players were allowed to enter 5 events, and she was the only player who won all five of the events she entered. No one has done it since, including herself! In 2001, she was ranked #1 in the Nation in her age division in both tennis and badminton . She loves competing, despite having to work around surgeries on her right foot, arthroscopic surgery on both knees, a knee replacement, a frozen left shoulder, a hernia, rotator cuff twice on the right shoulder, and cataracts in both eyes.